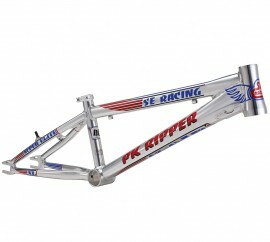 SE Racing has established themselves as making some of the best BMX-race frames on the market today. With 40 years of experience under their belt, it's no wonder why! This frame comes with a FREE PlanetBMX shop shirt! Pick you size in the dropbox above. By far, the most advanced PK Ripper frame of all time. The all-new PK Ripper Super Elite XL frame with a 21” top tube comes equipped with new features such as a tapered headtube, PF30 bottom bracket, and 20mm dropouts. Match it up with high-end race parts of your choice and you will surely smoke the competition.